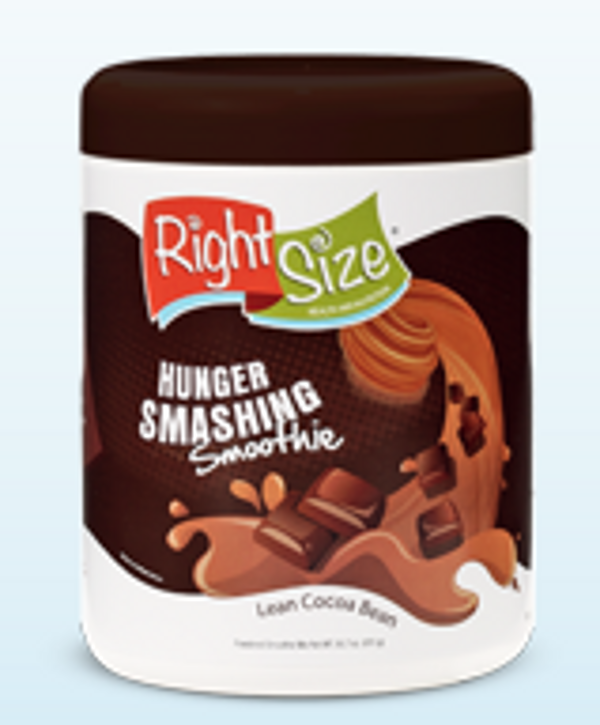 Right Size Smoothies: Does It Work or Is Right Size All Wrong? Companies that make products like Slim-Fast have always taken a strange approach to dieting. It seems they heavily promote taking the easy way out when it comes to losing weight. These companies try to convince you that you don’t have to eat right or exercise to achieve your desired weight loss results. And by popping a shake, swallowing a pill, or eating some God-forsaken diet bar, you’ll be skinny as a fishing pole without any of the gruesome effort. In short, these companies are saying “Hey, I know you like cakes and sweets -- we understand, you don’t have to restructure your level of discipline, just swallow these liquidy deserts and don’t deal with your mental fixation on eating unhealthy foods." I always envision companies saying these evil things to consumers in a creepy kind of whisper for some reason. Right Size Smoothies comes in powder form and I’ve also seen some in ready-made bottles on the infomercial. The diet drink is also sold on the company’s website and in retail stores like CVS, Walgreens, Shop ‘N Save, and Farm Fresh. A container of drink mix, which makes 30 servings, starts at around $55 on the site, and makers say the smoothies are made of Appemine which can suppress hunger. 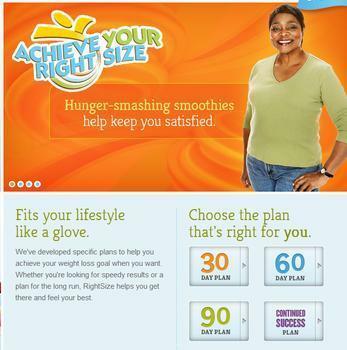 But instead, the infomercial uses the term “hunger manager,” which makes it seem like the user has a little more self- control over their food choices, and it’s not just the shake doing all the work. And like most companies trying to get a new product off the ground, Right Size attempts to draw you in by offering some sort of no-money-down commitment-free service, which usually does absolutely nothing for the consumer in terms of feeling more confident about a product. On its website, Right Size says it will send you two containers of smoothie mix for a couple of weeks free of charge, and you pick the flavors. Then if you are unhappy with the smoothie, the company says you should return the second container unused, along with the shipping cost of $18.80. Sounds easy enough, right? I mean, what can go wrong when you’re trying to get something for nothing? Well, a lot can go wrong, according to the postings on ConsumerAffairs. Take John of San Francisco, for example. He found out that giving Right Size Smoothies a two week try didn’t go so smoothly at all. Since John’s complaint he challenged the charge with his credit card company which is always the first thing one should do when getting a charge they don’t agree with. After going to the company’s website, it does mention something about not opening the second container, if you want a refund--in the frequently asked questions section--but the company makes no effort to make these terms evident, and whether that's intentional could easily be debated. But the questionable charge of $119.80 seems to be a consistent complaint among our readers, as Samaiyah from Milledgeville Ga. was told she had to pay this amount after first placing her order. “After I entered my credit card information in the automatic system, it said that I was going to be charged $119.80,” she wrote. I tried to cancel but my card was charged the $18 anyway. I called consumer service and she told me to send it back on the 10th and it will be cancelled. So today I called consumer service and the rep was trying to convince me to keep the product. This company is a scam," she wrote. What’s also interesting is that out of the 19 complaints posted in our review section, seven people in total have been charged $119.80 upon ordering or trying to cancel Right Size Smoothies. It seems just like most trial experiences, giving this product a free shot seems to be more trouble than it's worth. ConsumerAffairs phoned Right Size Smoothies to get a better understanding of why people are being charged this exorbitant price when there is supposed to be absolutely no charge for the trial. Also, if one opens the second canister of drink powder that’s one thing, but the fact that folks are being charged almost $120 off-the-cuff indicates at the very least that Right Size is communicating very poorly to its customers about all of the stipulations that go along with the free trial. We eventually reached a company representative by the name of Brandon in the complaints department, and asked him about the $119.80 charge a lot of people are getting, and he told us that all terms and conditions are on the website, and he couldn’t provide us any further information since we didn’t have a personal account with the company. Brandon also seemed extremely reluctant to answer the question about the hefty charge, although he did indicate that he was familiar with the specific complaint. Although we didn’t get an exact response from the company about the many complaints it receives, the fact it didn’t want to at least provide a statement is a bit telling. And as far as the actual product, how does it work? Has it made people lose weight? It’s safe to assume that many users of Right Size Smoothies will lose some sort of weight, because along with the shakes, the company tells you to eat less and have healthy balanced snacks, as if Right Size Smoothie invented this particular method of dieting. The good news is whether you consume Right Size Smoothies or not, you’re bound to shed pounds if you do the other things the company suggests. Also, Right Size hasn’t done a great job in explaining how its product is different from similar weight loss beverages. All and all there is no quick fix to weight loss, and replacing your desire for chocolate cake with a desire to consume chocolate smoothies probably isn’t the right mental approach when trying to lose weight. And lastly, if there was a brand new revolutionary weight loss product that was far superior from exercising and eating right, consumers would see these miraculous new findings plastered by every media outlet in the world. They wouldn’t see these world-changing-diet-results late at night, on some obscure cable channel, that's for sure.